For our last project in Visual Culture and Design, we were asked to design both a poster series and a digital work in tandem which each could potentially be exhibited at a local museum. 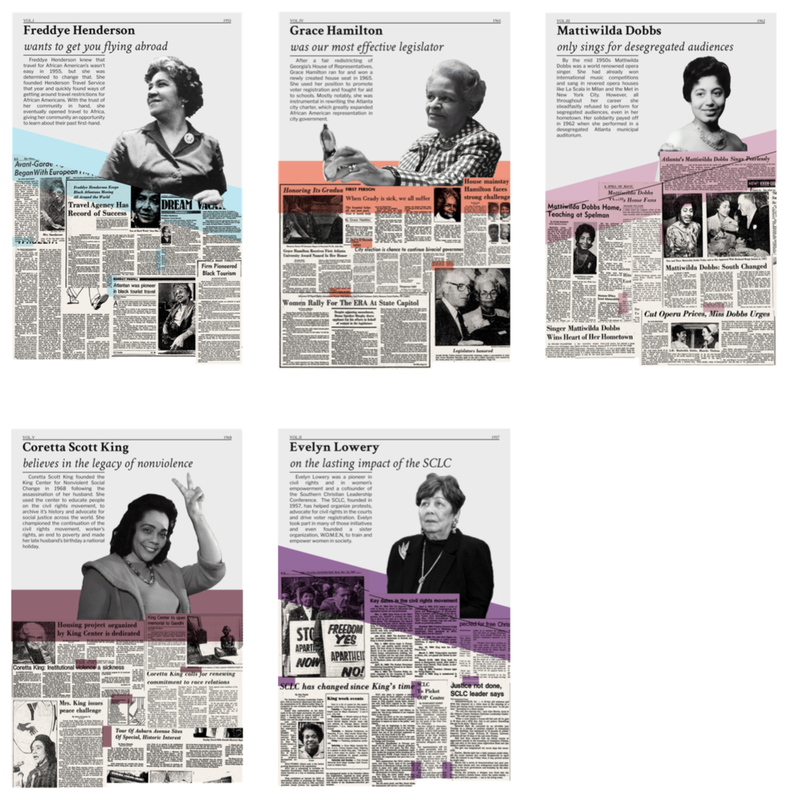 We were to highlight notable Atlanta women of the civil rights movement. Unlike previous projects, working on two pieces at the same forced us to consider what makes a good media strategy across works. Bearing that in mind, Henry Kim and Pierce McBride designed Of Historic Note, which sought to highlight the achievements of women from the civil rights movement through newspapers. We already had familiarity with the figures in question, but because this project required designing digital and physical components, it wasn’t enough to simply highlight these figures. Instead, we had to construct a through line across which a reader could start their experience with our work, progress through it and leave with a greater understanding of the women we highlight. At the beginning brainstorming for a poster, we focused together on different iterations. After finalizing a big structure, Pierce focused on details on it and Henry concentrated on designing a mobile app. This problem of a conceit plagued the first two weeks of the project. The initial assumption was that our digital work needed to integrate with the physical design. Given that we were also designing around museum spaces, this approach seemed to make sense. We considered options like physical posters with monitors that, if the right object were scanned, would rely on a fictional dramatization of people from the era. We also considered AR components that, if museum attendees swiveled a co-located iPad to face different posters, could reveal additional details and media artifacts. Again, in retrospect, it’s not hard to see we were reaching. Those ideas didn’t last, and we realized that complex digital components would likely actually distract both readers and us from the actual content. The figures and their achievements. This led us to flounder a bit and try out a design that revolved around a metaphorical neighborhood of civil rights. We tried taking photographs of some historical landmarks in Atlanta and incorporating those pictures into some designs. Again though, we found ourselves overly concerned with the hook. After a class critique, we realized it we had again overstretched and needed to start over. However, this ended up helping in a circuitous way, because our interest in old buildings led to an interest in old newspapers. While doing a complete revision of our first pass on the posters, we stumbled upon an amazing resource. Like a lot of historic newspapers, the Atlanta Journal-Constitution has been digitally archived over the years. Georgia Tech pays for access to those archives, which most often serve as secondary sources for historical research. In our case though, we were extremely lucky that these newspapers were directly photographed onto microfilm, which ended up as images of the original newspapers. This, in our hands, was a conceit. Newspapers were an interesting source to simply read through during this process. They suggested a design method, collage, and even gave us quotes and images not otherwise recorded in the sources we used during the process. But perhaps most importantly, they helped us narrow down our ten possible figures to five, initially by who was most often written about. Coretta Scott King, who founded and ran the Martin Luther King Jr. Center for Nonviolence and Social Change in Atlanta as well as actively worked to make Martin Luther King Jr’s Birthday a national holiday. Mattiwilda Dobbs, who was one of the first black opera singers with a major international career. She also refused to play in Atlanta unless the audience was desegregated. Freddye Scarborough Henderson, who started Henderson Travel and helped book flights for black people when other travel agencies wouldn’t. Grace Hamilton, who was the legislator and the first black woman to serve in the Georgia General Assembly. Evelyn Lowery, who founded the SCLC and W.O.M.E.N, which worked to promote female leadership. Each of these women had a reason for showing up in the newspapers more often than some of the other possible choices. Mattiwilda Dobbs, for example, was a celebrity by virtue of her career as a performer. Coretta Scott King ran prominent civil rights organizations like the King Center for Non-Violent Social Change for decades. But what ended up being interesting was how, exactly, these women were talked about. What kind of articles were written, what language surrounded their name and in some cases when they were most often written about became interesting. It’s one thing to have the consolidated record of the facts. Wikipedia already provides that. It’s another to read how those facts were noted and contextualized by people of the era. This is what comes through newspapers. It took a few additional iterations to devise the best way to use these sources, but in the physical poster series, a few specific design elements carried through all the way to the final version. First was the focus on collage as a method. Even in these early images, we were toying with the arrangement of articles related to each figure. Artfully designing that arrangement took multiple weeks to carry out, but even in the original iterations, it’s clear we tried to let people treat them both as texture and as content. Second, we wanted the texture of these newspapers to come from the negative space they formed as well, specifically the negative space off the poster. Even in our original iterations, we were playing with how parts of the newspapers could be literally cut and pasted overtop on another so they could droop outside the 24x36 poster frame. Some versions at this time even had the composition broken into multiple pieces, which we imagined would extend to the right and left of each primary poster and would act somewhat like a breadcrumb trail between each figure’s poster. Lastly, we were toying with ways of making it clear what was the “editorial” content from us and what was the source content from the newspapers. While the age of the newspapers certainly helped, we wanted to design separate chunks of context that we could provide to readers, so readers could choose how far down into each poster they wanted to go. One could pass by and just read the names, read the explanatory text and the names, or close read the articles themselves. These ideas also permeated the digital work, which began to take shape after the hook for the posters was discovered. At the beginning, we wanted to use the digital platform to discover more about the individual we picked for the posters. Focusing on digital content, we wanted to include not only newspaper clips used on the poster, but other digital mediums such as photos and videos. After figuring out our initial approach, we started brainstorming how we are going to design and represent the digital platform. We had to figure out which platform we were going to design for first. While it was an option to install a big screen inside the museum to showcase our digital content, we wanted an audience to have the digital work as a companion as they walk around the exhibition. Designing for the smartphone was ideal, as was the use of a website rather than an app. To start we created a list of figures on the main page using a portrait image, a newspaper clip, and a highlighted color. Upon tapping on a figure, the audience could see images, newspaper clips used on posters, etc. However, after our first critique session for our mobile work, we chose to make major changes for the following reasons. First, if the audience wanted to see images of women, they can easily search to find. Second, not all of the figures had a plethora of multi-media available about them. Third, it skewed away from the concept of the posters themselves. Instead, we decided to use newspaper clips and write about them figures instead. In addition, we learned coding the digital version was not a requirement of this project, so we reverted to high-fidelity design tools. The final version of the digital work starts with our artist's statement, then showcases a swipeable list of all five figures. Upon taping on any of them, our audience can scroll through an essay about each figure, along with relevant newspaper clips. Our audience can also read the original newspaper clips if they desire. The final posters ended up in a strong place, as did the digital work. The physical works retained that collage component, though the physicality of collage, the messiness, was toned down to focus on maintaining newspaper legibility. The newspapers themselves were cropped and framed to help reader’s eyes differentiate between articles. The editorial content written by us harkens back to physical newspaper design without being a strict recreation (although some references, like the volume numbers, are already losing meaning to time). The physical poster series is slated to be showcased in 2018 at APEX Museum in Atlanta for Black History Month, which is beyond an honor for each of us. We’re proud of our results, and we’d like to leave you with our artist’s statement, which is our way of encapsulating our intent. During the civil rights era 1950s and 1960s, many women beyond the most well known civil rights leaders had a profound effect on the movement, though not everyone is remembered equally in the public consciousness.